So it's Monday again. On the bright side, many in the US have a short work week with it being Thanksgiving. I remember when I was in high school and worked at the local video store and had to work on every holiday including Thanksgiving and Christmas. I must say it is nice to work at a university and to get the main holidays off. Tonight I have the four-piece CND Vinylux holiday collection to show you. I hear that those up north are getting upwards of 10 inches of snow so I guess winter is here in some parts of the US. 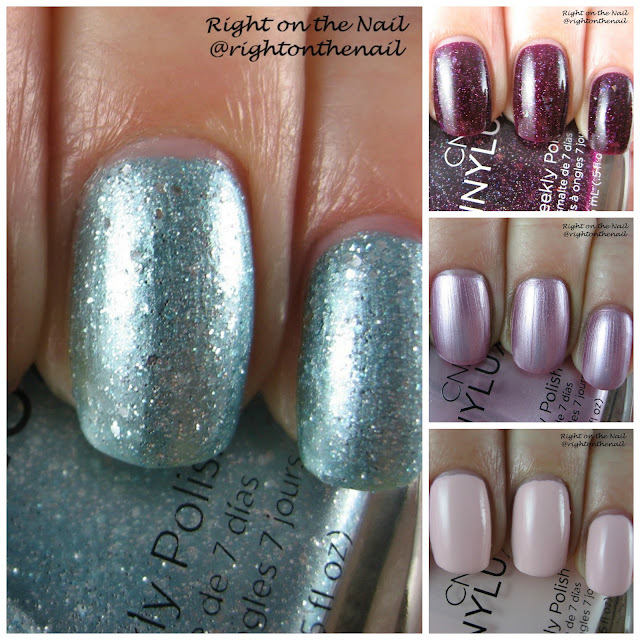 Follow me after the break to view some more swatches from the collection and to see my thoughts on the polishes. Glacial Mist is a light icy blue with tons of silver flakes and shimmer. I actually wore this for a full 6 days while I was in Minneapolis and I only had 1 tiny chip. I never get the chance to do wear tests, but this conference gave me a good reason to finally do one on the Vinylux polishes (I used the Vinylux Weekly Topcoat with it). Six days! I also followed the directions of not using a basecoat and that was not really a problem surprisingly. I found the formula and consistency to be perfect in just 2 coats. Nordic Lights is a plum jelly with lots of multi-colored shards and holographic glitter. The shards lay flat so you don't need a really thick topcoat and aren't extremely noticeable if you aren't looking closely. I thought 3 coats would be needed, but I stand corrected. The formula and application were flawless. Tundra is definitely going to be one of those polarizing polishes. If you're as old as me, you know that frosty colors like these were all the rage back in the 90s. Apparently frosts are on the comeback because the new Mariah Carey lipstick for MAC looks a lot like Tundra. Personally, this isn't my favorite polish, but I'm sure there is a market for it. You need to be really careful with brush strokes so have a light hand on the second coat. Winter Glow is the only creme of the collection and is a light pastel pink color. It's pretty, but it's not the most unique polish of the collection. It was also fairly sheer, and I think it is the only Vinylux polish I've worn that needed 3 coats due to some streaks. Overall, I'm happy with this small collection. My picks would be for Glacial Mist and Nordic Lights. I've only used the Vinylux polishes with their recommended topcoat (which I am extremely happy with), so I'm not sure about the wear with other topcoats. CND polishes retail for $10.50 and are a little hard to find. You can sometimes find them at Ulta, or any time online at popular e-tailers such as Loxa Beauty (who also happen to have Morgan Taylor and OPI polishes you can buy without the need of a license). Find more about CND on their Facebook, Twitter and Instagram pages.